The interview is fairly short but covers the most common questions about Recreation PPP's and private operation of public parks. It is on the World Bank blog here. As Obama pushes the US into a corporate state model like those in Europe, here is one cost we will face: increases in long-term unemployment. Already we see higher structural barriers being created to employment (preference for preferred unions, higher minimum wage, reduced internships) combined with increasing incentives to remain unemployed (extension of unemployment benefits, subsidized medical services). Most countries who move to this model experience very high long-term structural unemployment. The costs to add an employee in Europe are really, really high, meaning that it is only done reluctantly and the preference is for highly skilled workers (who is going to give a job for life to an untested, unskilled young worker?) Further, these states are run by a troika of large corporations, unions, and government insiders who protect each other from competition. Young unskilled workers are a competitive threat to established unions. Since these unions workers get above-market wages, they are protected from younger workers who are willing to offer their admittedly less skilled labor much cheaper. I was playing around with data released from the World Bank, and compared the US to a number of other industrialized countries on this metric. 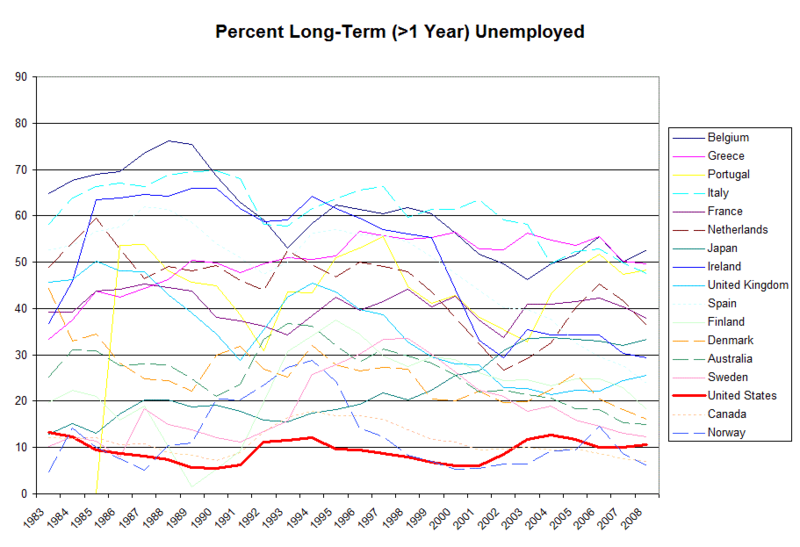 Even in past recessions, long-term unemployment has remained low in the US (click to enlarge). 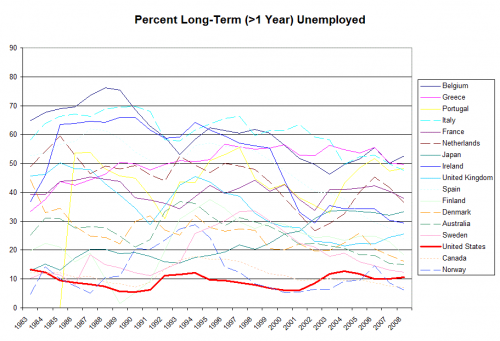 The metric is percent of total unemployed that are unemployed for longer than 1 year. Category: Climate | Comments Off on Let's Emulate India!